LUNDA NORTE PROVINCE, Angola, 5 November 2018 (UNFPA)* — The March 2017 outbreak of violence in the Kasai region of the Democratic Republic of the Congo has displaced some 1.4 million people and forced over 35,000 others to flee to Lunda Norte Province, Angola. Roughly 75 per cent of refugees from Kasai in Angola are women and children. Women and girls displaced by conflict face extraordinary hardships. Many endure grave risks, including gender-based violence, which can escalate in humanitarian settings. Most are thrust into poverty – cut off from education and life-saving health services. 7 November 2018 (UN Environment)* — Pakistani customs officers trained by UN Environment are responsible for a massive seizure of R-22 (also known as HCFC-22) refrigerant, a powerful ozone-depleting substance and greenhouse gas. In the largest seizure of its kind for Pakistan, customs authorities confiscated 18,000 kilogrammes of the smuggled refrigerant at Karachi Port in mid-October. The bust came when a customs appraisement officer, Rahmatullah Vistro, received information that an attempt would be made to illegally import huge quantities of the gas. Vistro is one of a number of customs officers around the world who have received UN Environment training to identify ozone-depleting substances smuggled by misdeclaration and mislabeling, among other methods. Intense fighting near a major hospital in the Yemeni port city of Hudaydah has put scores of children at “imminent risk of death”, the United Nations Children’s Fund (UNICEF) warned on Tuesday [6 November 2018], calling on the warring parties to stop hostilities near the medical centre and allow those in need to safely access treatment. 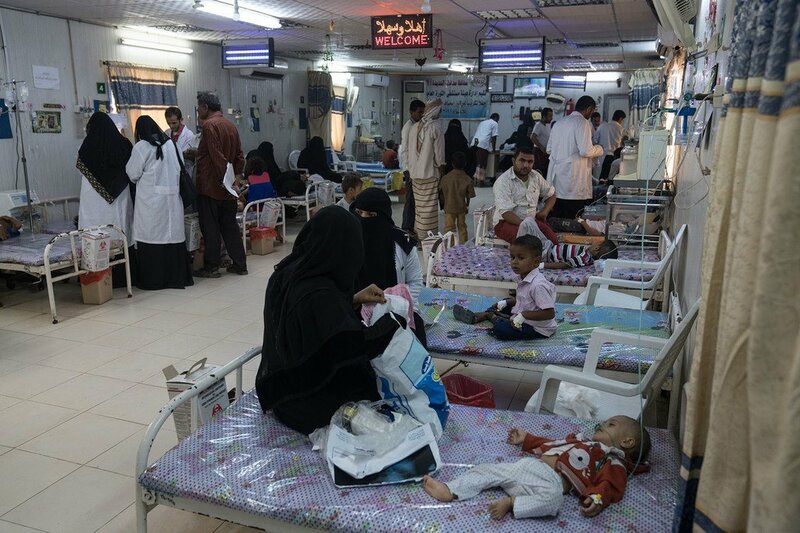 OCHA/Giles Clarke | A file photograph of patients undergoing treatment at the Al Thawra hospital in Hudaydah, Yemen.